G. V. Black (1891) concept of “Extension for prevention” for the treatment of caries is replaced today by “Prevention of Extension” leading to the new philosophy of “Minimal Intervention Dentistry” as it is of fundamental importance to use conservative procedures that minimize the removal of healthy tooth structure and simultaneously prevent the lesion progression. The disadvantages of using conventional drill (CD) method include the possibility of overextending the cavity, removal of healthy tissue, pressure and heat on the pulp, vibration, noise, pain stimulation, and the need for local anesthesia has encouraged developing an alternative method for caries removal such as lasers, air abrasion, ultrasound, and chemomechanical caries removal (CMCR). Chemomechanical elimination of carious dentin has so far proved to be a promising method, particularly in pediatric dentistry, and for anxious or medically compromised patients which has the capacity to distinguish the internal carious tissue (affected dentin) from the more superficial and highly infected tissue (infected dentin), by which it affords pulp protection and remineralization of affected dentin. 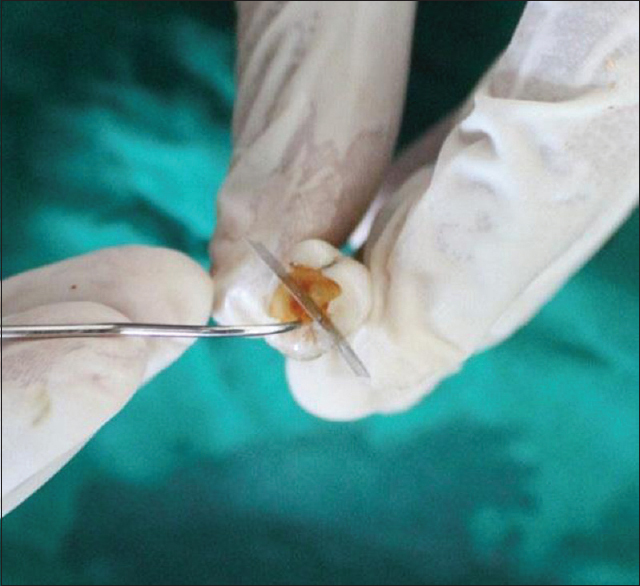 Latest theories regarding the rationale of carious dentin removal are also beginning to question the amount of tissue that needs to be excavated to successfully treat a caries tooth while removing demineralized dentin. It is not always easy to make a decision at which point to stop excavation because there is an apparent lack of objective clinical markers. However, hardness of dentin might be a useful marker in this respect. 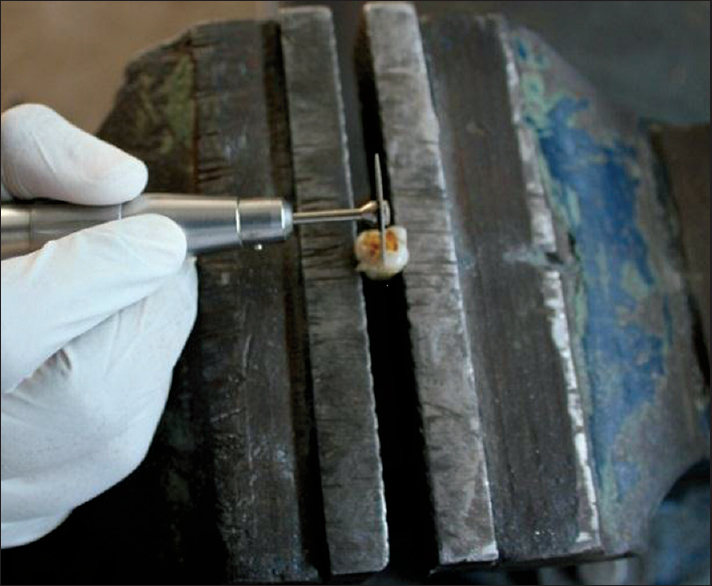 Hardness analysis has been used as a method to assess loss and reincorporation of minerals to the dental tissue because the reduction in the numerical hardness value presents a linear relation to mineral loss. Furthermore, a strong relationship exists between hardness of dentin and the respective bond strength. Hence, hardness provides a first step toward predicting the behavior of dentin/restoration interfaces. Nanoindentation test is a variety of indentation hardness test applied to small volumes such as teeth which contain nanosized structures. This technique has the ability to produce small indentations under small loads. Thus, the aim of the study was to compare and evaluate the nanohardness of the dentin after CMCR (Carie-care) method with conventional method (CD-rotary instrument) in both primary and permanent teeth using nanoindenter. This was an in vitro randomized controlled trial. 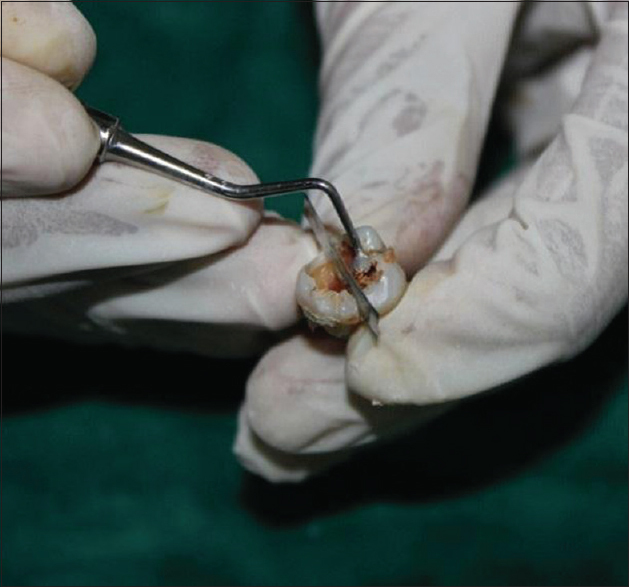 Fifteen primary molars (Group-1) with active carious lesion extracted due to normal physiological root resorption and fifteen permanent molars (Group-2) with active carious lesion extracted due to periodontal pathology were collected. Teeth that had active caries lesion with open cavities, easily accessible caries, and radiographically caries extending half the distance through the dentin, with no radiographic evidence of internal resorption were included in the study, and teeth with any developmental tooth defects, caries extending to the pulp, and caries involving only enamel were excluded from the study. The samples selected were cleaned in running water to remove the visible debris. All the soft and extrinsic deposits attached to the root portion of the teeth were removed using a hand scaler and the samples were stored in 10% formalin  for 2 weeks according to guidelines for infection control of extracted teeth used for research and teaching given by the Centers for Disease Control and Prevention. 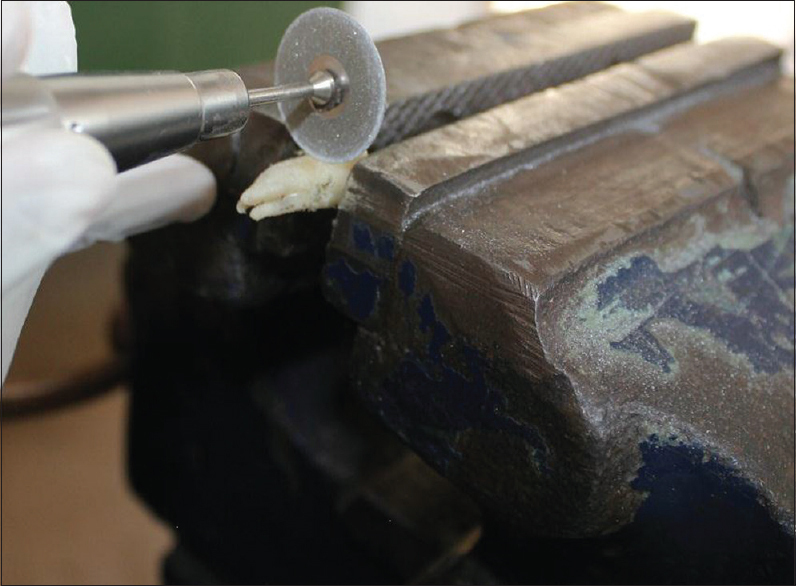 Each sample was placed in the jig and the carious portion of the tooth was divided into two halves by passing the diamond disc through the middle of the carious lesion in mesiodistal direction  (split tooth methodology). The sectioning was done with micromotor and a diamond disc using water as coolant [Figure 1]. Group 2a: Cavity prepared using CD method (rotary instrument-bur) in permanent molars; Group 2b: Cavity prepared using CMCR (Carie-care) in permanent molars. A matrix band was placed between the two halves of each tooth along the cut line for separation [Figure 2]. 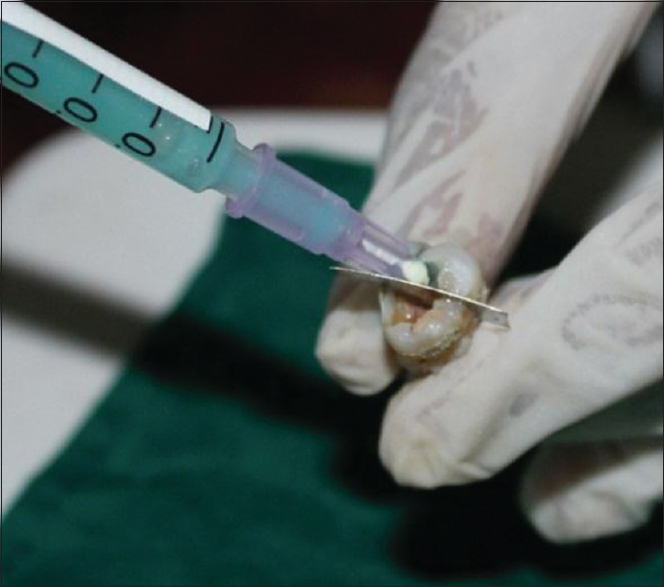 For CD group, carious tissue removal was performed with a spherical diamond point (Mani– BR-31, 41, 45) with the largest diameter compatible with the cavity size using water as a coolant until an unstained hard pulpal floor was reached to ensure no carious lesion is left behind [Figure 3]. For CMCR group, the gel was used as per the manufacturer instruction which was applied and left in the cavity for 1 min [Figure 4]. When the gel was cloudy, it was removed gently by scraping using spoon excavator without applying pressure [Figure 5]. The gel was reapplied until it presented a light coloring, indicative of nonexistence of softened carious tissue. The gel was then removed and the cavity was wiped with a moistened cotton pellet and rinsed with water as per the manufacturer instruction. Complete caries removal was confirmed using a dental explorer by passing it easily over hard sound dentin which did not “catch” or give a “tug-back” sensation [Figure 6]. The specimens were placed in the jig and sectioned horizontally at the level of floor of the cavity and then at the cementoenamel junction using diamond disc and water coolant [Figure 7]. The samples were subjected to nanohardness test in the nanoindenter (Hysitron TI 750H Ubi) [Figure 8]. The tests were performed in load-controlled feedback mode to a peak force of 500 µN for permanent teeth and 250 µN for primary teeth. A load function consisting of 5-s loading to peak force segment, followed by 5-s hold segment, and 1-s unloading segment was used (standard testing mode used: Quasi-static nanoindentation). Nanohardness readings at six different points on every specimen for both CD and CMCR were generated. The indents were spaced approximately 50–100 µm apart and performed using automation. The data obtained were subjected to statistical analysis using SPSS Inc. Released 2008. SPSS Statistics for Windows, Version 17.0. Chicago: SPSS Inc. for descriptive and analytical statistics. To compare the mean nanohardness between the two methods (CD and CMCR groups) in the primary and permanent groups, unpaired Student's t-test was used. To compare the mean nanohardness between the 4 subgroups, analysis of variance (ANOVA) was used and to find out the exact significance among 4 groups, a post hoc test, i.e. Bonferroni test was performed. A P< 0.05 was considered statistically significant. 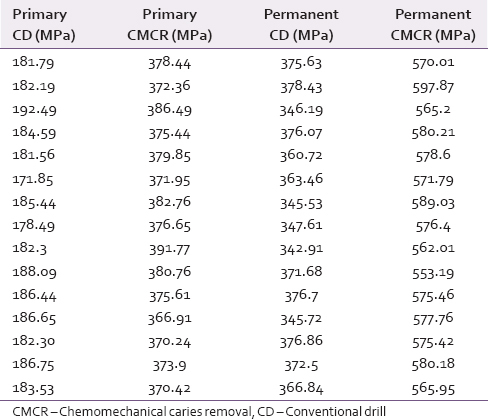 The mean nanohardness of dentin at 6 different sites were evaluated for 15 primary teeth and 15 permanent teeth for both CD and CMCR methods, and the results were tabulated [Table 1]. 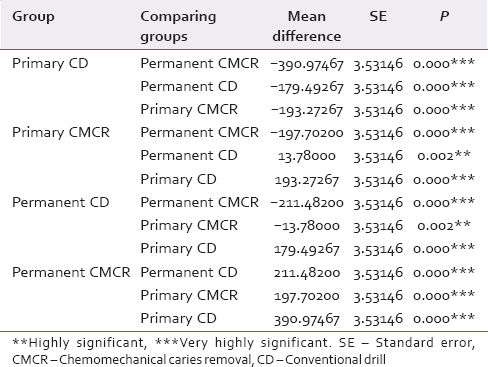 The mean nanohardness of dentin in both primary and permanent teeth obtained from the CMCR group (376.90 and 574.60, respectively) was found to be very highly significant compared to that of the CD group (183.63 and 363.12) with P<0.05 [Table 2] and [Table 3]. The mean nanohardness of dentin for all the 4 subgroups was compared using ANOVA. The comparison showed an existence of statistical significance between the subgroups with P< 0.05 [Table 4]. Multiple comparisons among the 4 subgroups using post hoc Bonferroni test showed that the mean difference in the nanohardness of dentin between the primary CMCR and permanent CD method was found to be highly statistically significant (P - 0.002). Moreover, the comparison between all the other subgroups was found to be very highly statistically significant (P - 0.000) [Table 5]. Even today, the operative dentistry focuses on cavity design and selecting restorative materials. Less effort has been placed on incorporating what is known about the pattern of caries progression and how it relates to caries removal or excavation. Hence, based on these concepts, minimal intervention dentistry is introduced which require the removal of only the infected dentin and preservation of the affected dentine which is also necessary for supporting the future restoration. Carie-care, a recently introduced CMCR agent, was preferred in this study as it is a gel prepared from papain and chloramines, which is less expensive than Carisolv  and can be used similarly to papacarie. Knowledge of the mechanical properties of caries-affected dentin is important to understand how such a substrate reacts under masticatory loading conditions  and to help predict the behavior of the tooth/restoration interface. Microhardness testing such as Vickers and Knoop indenters are commonly used for this purpose. However, large errors are observed with these testings as it requires direct imaging, usually visual measuring, of the width or area of the indentations, to obtain hardness. To overcome the disadvantages of microindentation methods, nanoindentation technology has been recently introduced as a reliable way to study the nanomechanical alterations of mineralized tissues ,,,, as it is a nondestructive method in which very small indentations (<1 mm) are produced using loads of a few milli-Newtons , and it allows more indentations to be executed per specimen, and the specimens were better scanned to select the appropriate location for indentations. Various literature regarding the microhardness values of permanent teeth ,,,, after caries removal are available, but only very few studies are reported for primary teeth.,,, In spite of the differences existing between primary and permanent teeth in terms of their degree of mineralization, structure, mineral loss, and reactivity to fluoride,, only a few studies are reported that specifically deal with primary tooth microhardness after caries removal. Currently, there are no reports which directly compare the hardness of remaining dentin in primary and permanent teeth after caries removal using CD and CMCR. The mean nanohardness of dentin in primary teeth following CD was 183.63 MPa which was lower than the values reported by Al-Rawi (559.2 MPa). This could be attributed to the fact of variations in the caries extension and remaining dentin thickness as the hardness of primary dentin deteriorates as a function of distance toward the pulp. Such deterioration in mechanical behavior is likely to correspond to change in both the inorganic content and histological structure of dentin. The mean nanohardness of dentin in primary teeth following CMCR method was 376.90 MPa which was almost similar to the study reported by Prabhakar et al. (363.8 MPa) but lower than the studies reported by Flückiger et al. (500.53 MPa) and Al-Rawi (559 MPa). The mean nanohardness of dentin in permanent teeth following CD was 363.12 MPa which was comparatively lower than the study reported by Qasim and Suliman (594.28 MPa). This could be due to the variations in the depth and site of indentation in the teeth selected which was governed by several factors such as the calcification level of dentin, the difference in dentinal tubule density at different locations (increased tubule density near the pulp was shown to correspond with reduced hardness), the reduced hardness of the inter-tubular dentin when approaching the pulp, and the distance from the dentinoenamel junction. The mean nanohardness of dentin in permanent teeth following CMCR method was 574.60 MPa which was marginally higher than the study reported by Ramamoorthi et al. using Carie-care (556.70 MPa). On comparing the hardness values of other studies reported using Carisolv with the present study, the results obtained were similar to studies reported by Sankar et al. (587.4 MPa) and Ramamoorthi et al. (573.99 MPa) but slightly lower than the study reported by Qasim and Suliman (606.6 MPa). Thus, based on the results obtained from the present study and comparison with the previous studies, Carie-care was found to have similar efficacy as Carisolv. Similarly, a statistically significant difference was found between the nanohardness of dentin in primary and permanent teeth samples after two methods of carious removal in the present study. This variability in the hardness of dentin is a function of several parameters such as position, tubule dentistry, microstructure, and age of the dentin substrate. Limitations of the study include small sample size, caries detection with basic methods, utilization of gross sectioning method to split the tooth, and in vitro measurement of hardness of dentin. The remaining dentine after caries removal using CMCR method was harder than CD method in both primary and permanent teeth. The remaining dentine of the permanent teeth was harder than the primary teeth after caries removal using both the CMCR and CD methods. Carie-care being a new product in the market needs further clinical trials and long-term in-vivo follow-up studies. I acknowledge Dr. Manivasagam (Department of Nano Technology) for giving us technical support and my mother and father Mrs. Meenamurali and Dr. S. Murali, respectively for constant support and encouragement. Fusayama T. Two layers of carious dentin; diagnosis and treatment. Oper Dent 1979;22:401-11. Ogushi K, Fusayama T. Electron microscopic structure of the two layers of carious dentin. J Dent Res 1975;54:1019-26. Qasim AS, Suliman AA. 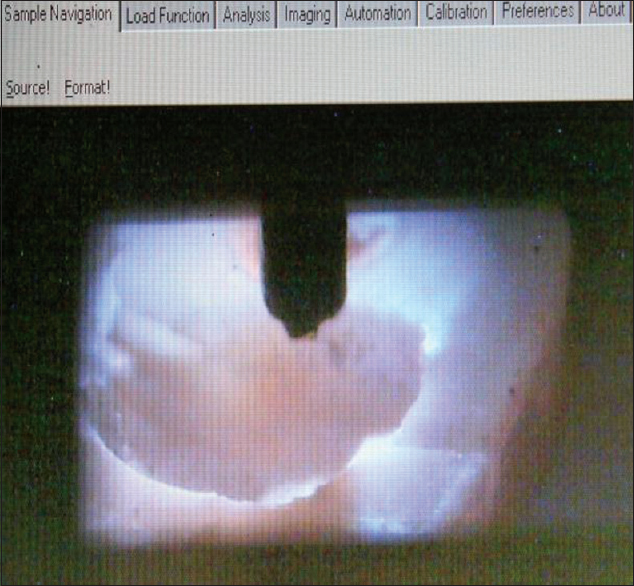 Evaluation of chemomechanical caries removal (Carisolv™) using the Vickers hardness test “An in vitro study”. J Minimum Interv Dent 2008;1:113-25. Mollica FB, Rocha Gomes Torres C, Gonçalves SE, Mancini MN. Dentine microhardness after different methods for detection and removal of carious dentine tissue. J Appl Oral Sci 2012;20:449-54. Panighi M, G'Sell C. Effect of the tooth microstructure on the shear bond strength of a dental composite. J Biomed Mater Res 1993;27:975-81. Marshall GW Jr., Marshall SJ, Kinney JH, Balooch M. The dentin substrate: Structure and properties related to bonding. J Dent 1997;25:441-58. Chung CJ, Wu BH, Lin JF, Chuang SF, Han CF, Li WL. Nano-Structure and Nano-Mechanical Properties of Human Teeth. Proceedings of the 2011 6th IEEE International Conference on Nano/Micro Engineered and Molecular Systems, Kaohsiung, Taiwan; 20-23 February, 2011. Hosoya Y, Marshall GW. The nano-hardness and elastic modulus of sound deciduous canine dentin and young premolar dentin – preliminary study. J Mater Sci Mater Med 2005;16:1-8. Lee JJ, Nettey-Marbell A, Cook A Jr., Pimenta LA, Leonard R, Ritter AV. Using extracted teeth for research: The effect of storage medium and sterilization on dentin bond strengths. J Am Dent Assoc 2007;138:1599-603. Kohn WG, Collins AS, Cleveland JL, Harte JA, Eklund KJ, Malvitz DM; Centers for Disease Control and Prevention (CDC). Guidelines for infection control in dental health-care settings-2003. MMWR Recomm Rep 2003;52:1-61. Peters MC, Flamenbaum MH, Eboda NN, Feigal RJ, Inglehart MR. Chemomechanical caries removal in children: Efficacy and efficiency. J Am Dent Assoc 2006;137:1658-66. Available from: http://www.hysitron.com/LinkClick.aspx?fileticket=nUIvWIWFK1w%3D and tabid=50. [Last accessed on 2013 Sep 10]. Available from: http://www.repository.uwyo.edu/cgi/viewcontent.cgi?article=1548 and context=ugrd. [Last accessed on 2013 May 20]. Bjørndal L. Buonocore memorial lecture. Dentin caries: Progression and clinical management. Oper Dent 2002;27:211-7. Cecchin D, Farina AP, Orlando F, Brusco EH, Carlini-Júnior B. Effect of carisolv and papacárie on the resin-dentin bond strength in sound and caries-affected primary molars. Braz J Oral Sci 2010;9:25-9. Meredith N, Sherriff M, Setchell DJ, Swanson SA. Measurement of the microhardness and Young's modulus of human enamel and dentine using an indentation technique. Arch Oral Biol 1996;41:539-45. Kinney JH, Balooch M, Marshall SJ, Marshall GW Jr., Weihs TP. Hardness and Young's modulus of human peritubular and intertubular dentine. Arch Oral Biol 1996;41:9-13. Sakoolnamarka R, Burrow MF, Swain M, Tyas MJ. Microhardness and Ca: P ratio of carious and Carisolv treated caries-affected dentine using an ultra-micro-indentation system and energy dispersive analysis of x-rays – a pilot study. Aust Dent J 2005;50:246-50. Doerner MF, Nix WD. A method for interpreting the data from depth sensing indentation instruments. J Mater Res 1986;1:601-9. Habelitz S, Marshall SJ, Marshall GW Jr., Balooch M. Mechanical properties of human dental enamel on the nanometre scale. Arch Oral Biol 2001;46:173-83. Cuy JL, Mann AB, Livi KJ, Teaford MF, Weihs TP. Nanoindentation mapping of the mechanical properties of human molar tooth enamel. Arch Oral Biol 2002;47:281-91. Ge J, Cui FZ, Wang XM, Feng HL. Property variations in the prism and the organic sheath within enamel by nanoindentation. Biomaterials 2005;26:3333-9. Bao YW, Wang W, Zhou YC. Investigation of the relationship between elastic modulus and hardness based on depth-sensing indentation measurements. Acta Mater 2006;52:5397-404. Oyen ML. Nanoindentation hardness of mineralized tissues. J Biomech 2006;39:2699-702. Oliver WC, Pharr GM. An improved technique for determining hardness and elastic modulus using load and displacement sensing indentation experiments. J Mater Res 1992;7:1564-74. Willems G, Celis JP, Lambrechts P, Braem M, Vanherle G. Hardness and Young's modulus determined by nanoindentation technique of filler particles of dental restorative materials compared with human enamel. J Biomed Mater Res 1993;27:747-55. 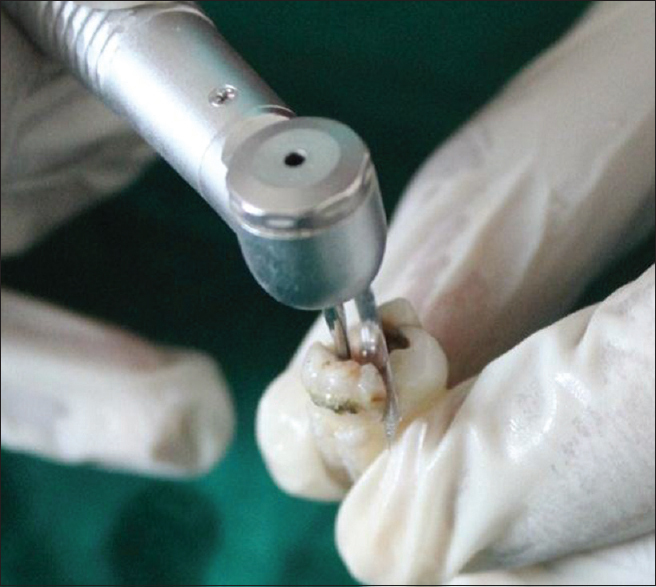 Hossain M, Nakamura Y, Tamaki Y, Yamada Y, Jayawardena JA, Matsumoto K. Dentinal composition and Knoop hardness measurements of cavity floor following carious dentin removal with Carisolv. Oper Dent 2003;28:346-51. Flückiger L, Waltimo T, Stich H, Lussi A. Comparison of chemomechanical caries removal using Carisolv or conventional hand excavation in deciduous teeth in vitro. J Dent 2005;33:87-90. Magalhães CS, Moreira AN, Campos WR, Rossi FM, Castilho GA, Ferreira RC. 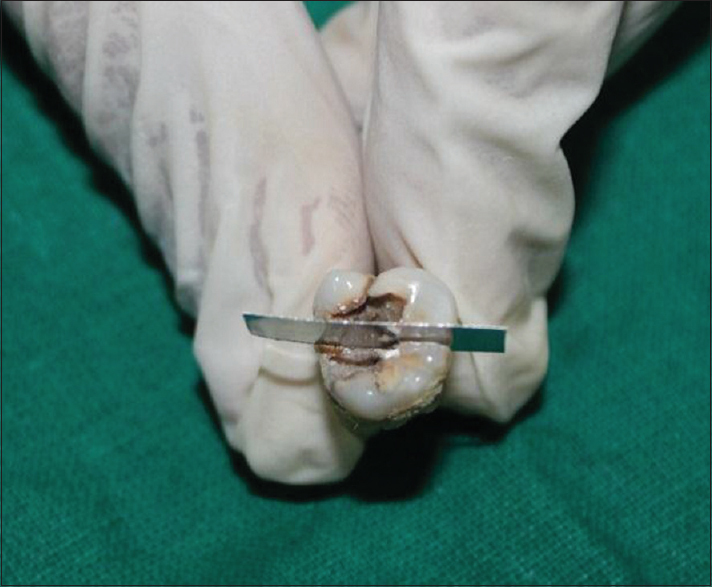 Effectiveness and efficiency of chemomechanical carious dentin removal. Braz Dent J 2006;17:63-7. Sankar J, Shivanna J, Dhanyakumar NM. Efficacy of chemo-mechanical method (carisolv) of caries removal with that of hand cutting and rotary cutting instruments. Ann Essences Dent 2011;4:27-31. Al-Rawi BA. Evaluation of chemo-mechanical caries removal (Carisolv ™ Gel) on primary teeth: A microhardness study. Dent J 2012;12:289-94. Prabhakar AR, Kaur T, Basappa N. Comparative evaluation of carisolv in removal of carious dentin in primary molar teeth: In vitro study. Pesquisa Brasileira em Odontopediatria and Clinical Integrated 2013;9:77-80. Fejerskov O. Concepts of dental caries and their consequences for understanding the disease. Community Dent Oral Epidemiol 1997;25:5-12. Sønju Clasen AB, Ogaard B, Duschner H, Ruben J, Arends J, Sönju T. Caries development in fluoridated and non-fluoridated deciduous and permanent enamel in situ examined by microradiography and confocal laser scanning microscopy. Adv Dent Res 1997;11:442-7. Fusayama T, Okuse K, Hosoda H. Relationship between hardness, discoloration, and microbial invasion in carious dentin. J Dent Res 1966;45:1033-46. Ogawa K, Yamashita Y, Ichijo T, Fusayama T. The ultrastructure and hardness of the transparent layer of human carious dentin. J Dent Res 1983;62:7-10. Available from: http://www.gordonengland.co.uk/hardness/hvconv.htm. [Last accessed on 2013 Sep 10]. Available from: http://www.en.wikipedia.org/wiki/Knoop_hardness_test. [Last accessed on 2013 Sep 10]. Angker L, Swain MV, Kilpatrick N. Micro-mechanical characterisation of the properties of primary tooth dentine. J Dent 2003;31:261-7. Ramamoorthi S, Nivedhitha MS, Vanajassun PP. Effect of two different chemomechanical caries removal agents on dentin microhardness: An in vitro study. J Conserv Dent 2013;16:429-33. Nazari A. A Hybrid Evaluation of Toughening and the Crack Growth Resistance of Human Dentin. 1st ed. Ann Arbor: ProQuest; 2008. p. 41. Available from: http://sem-proceedings.com/09s/sem.org-SEM-2009-Ann-Conf-s070p01-A-Hybrid-Evaluation-Toughening-Human-Dentin.pdf. [Last cited on 2013 Sep 15].